The 1% Have To Wash Dishes By Hand? The Horror! Call it the 1% blues, first world problems, or just plain upper class angst. Whatever it may be, expect to set these vanities aflame. After earning receiving, dare we say, smaller bonuses, Bloomberg's Max Abelson reported on the withering well-being of their dwindling bank accounts. Wall Street titans complained to the beat reporter about the real-world hardship of surviving on $250,000 a year in a 1,200 square foot floor plan. How could anyone possibly afford an off-white business card with raised lettering and a watermark? If we're to understand this persecuted minority (womp), it's best to put it into context. Are they just like us? You be the judge. 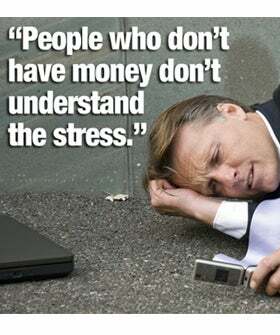 Can people who don't have money possibly understand stress? And, really, can you learn to wash your own dishes by hand? !